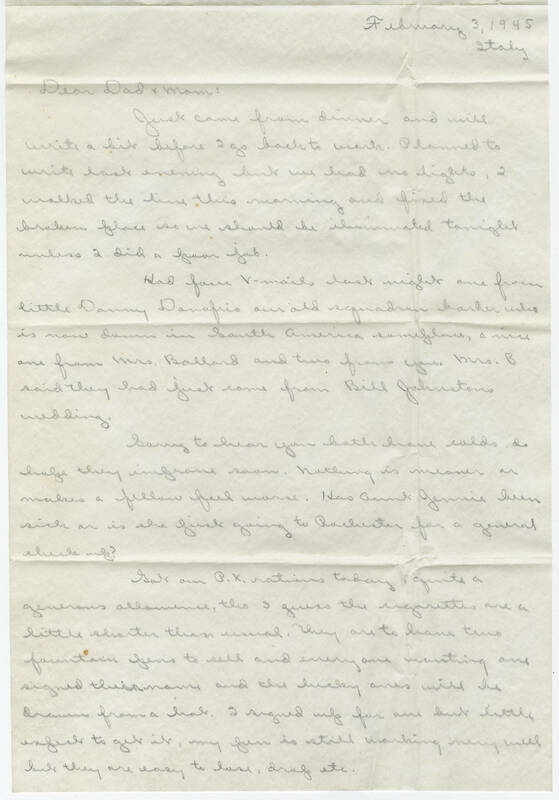 February 3, 1945 Italy Dear Dad & Mom: Just came from dinner and will write a bit before I go back to work. Planned to write last evening but we had no lights, I walked the line this morning and fixed the broken place so we should be illuminated tonight unless I did a poor job. Had four V-mails last night one from little Danny Danafrie our old squadron barber who is now down in South America someplace, a nice one from Mrs. Ballard and two from you. Mrs. B said they had just come from Bill Johnstons wedding. Sorry to hear you both have colds. I hope they improve soon. Nothing is meaner or makes a fellow feel worse. Has Aunt Jennie been sick or is she just going to Rochester for a general check up? Got our P.X. rations today, quite a generous allowance, tho I guess the cigarettes are a little shorter than usual. They are to have two fountain pens to sell and every one wanting one signed their name and the lucky ones will be drawn from a hat. I signed up for one but little expect to get it, my pen is still working very well but they are easy to lose, drop etc.